We are pleased to offer Dr. Kelly Raber’s newest book! Summary: The TumorX Anti-cancer protocol demonstrating how bloodroot, pancreatic enzymes, and Q-10, can treat, cure and prevent cancer. This is the step by step guide that works! This book is filled with scientific research about nutrients and its application for the human body to cure all types of cancers. Is your allopathic treatment for cancer not working? Are you lost in the forest of "Do's and Don'ts" of the alternative cancer world? Maybe you want to use both allopathic and alternative treatments combined. I am here to tell you that you can. Cancer is not a disease that will forgive your trials and errors. When you choose to treat your cancer naturally, you need a plan that is tried and true. You need a real protocol that has worked in 1000's of cases. I developed that tried and true protocol which kills cancer cells. Now, I offer you the knowledge to fight and overcome the scariest disease on earth with my TumorX Protocol that has literally worked for thousands of people just like you. 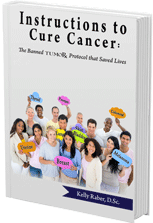 This concise guide is not meant to cover all the different aspects of cancer, but rather to put you on the fast track to killing your cancer. regardless of the treatment they choose: natural or allopathic. My plan allows you the freedom to eat the foods you want. My food guide shows you what to eat when consuming the amazing nutrients given to us by God to kill cancer. Killing cancer is not a crime; it is a right. While the FDA has banned me from selling the actual supplements for you to consume, they cannot ban me from providing you the written instructions.